Chipotle Mexican Grill, Inc., a Delaware corporation, together with its subsidiaries (“Chipotle”, the “Company”, or “we”) operates Chipotle Mexican Grill restaurants, which serve a focused menu of burritos, tacos, burrito bowls (a burrito without the tortilla) and salads, made using fresh ingredients. As of December 31, 2016, we operated 2,198 Chipotle restaurants throughout the United States, as well as 29 international Chipotle restaurants, and we also had 23 restaurants in operation in other non-Chipotle concepts. We focus on finding the highest quality ingredients we can to make great tasting food; on building a strong people culture that is centered on providing an excellent guest experience; on building restaurants that are operationally efficient and aesthetically pleasing; and on doing all of this with the highest regard for the safety of our customers and increasing awareness and respect for the environment. We have grown substantially over the past five years, and expect to open between 195 and 210 additional restaurants in 2017. Throughout our history as a public company, we have pursued a mission to change the way people think about and eat fast food. 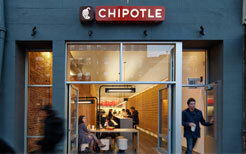 The fast food landscape has changed dramatically over Chipotle’s 23-year history. The changes in the industry suggest that we may have achieved our mission, with a number of concepts built using service and sourcing formats that closely resemble ours — with more selective sourcing, food prepared onsite, and a service model that allows customers to choose exactly what they eat. Looking at what we have accomplished, we have expanded our mission. Today, we are working to Ensure that better food, prepared from whole, unprocessed ingredients is accessible to everyone. We are also aiming to simplify our business focus, to emphasize only those things that result in an excellent guest experience in our restaurants.